The history of this place is really amazing. Back in 1977, a group of Istrians from the small town of Labin (Croatia) formed this club for football purposes. 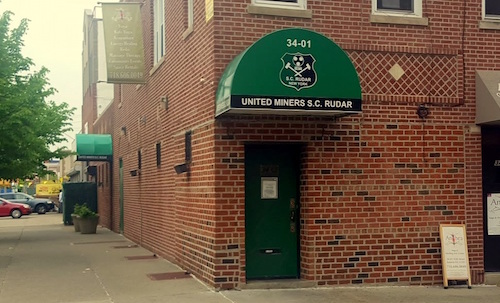 As a majority of them worked in the mine before immigrating, they called themselves the United Miners Soccer Club. The ground level bar is a gathering place for the Croatian community, and as you enter the intense glares might be a little intimidating. But rest assured everyone is happy to see you here, it's just a bit of surprise that you have happened upon the place. Down the staircase past the bar to the right, you will find first a small hallway, and then a very nice dining room and waiters wearing vests and ties. The service and feel are not that stuffy though, and questions are met with smiles and as good an answer as language barriers will allow. The menu is quite thorough, with a Croatian bent on many familiar Balkan specialties. It's not exactly cheap, but you don't feel the prices are unwarranted either. A good way to start is with an Istrian classic, fuzi sa zvacetom istarski ($12, below), a sort of bow tie pasta served with small chunks of veal and sauce. Before anything comes to the table, you might be approached by children from other tables while enjoying heavy Slavic ballads and pop on the stereo. Grab a 1/2 liter of house wine ($8 !!) which gives about a glass and a half each for two. The brick fireplace is not on, but the atmosphere is exactly as if it were; cozy, charming, and easy to relax. It does not feel like New York City at all. 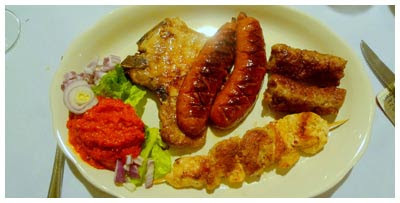 We steered our decisions for entrees towards meat, as any self-respecting Croatian would. The meat combo plate mjesano meso na zaru ($15, above) was not bad, but some of the meats were a bit dry. Thankfully a generous portion of ajvar accompanied the plate and could be dolloped on everything. A better way to enjoy the meats seemed to be with a nice amount of sauce. The teleci odrezak sa gljivama ($16, below) was the winner of the night with a fine wine and mushroom sauce slathered on otherwise unremarkable cuts of veal. We all love meat and potatoes together, so it is worth ordering a side portion of blitva s krumpiron ($4, below), which is mashed with Swiss chard. On its own it is not that full of taste, but it combines well with chunks of meat from the platters. Be sure to take a moment and ask your servers about the history of the place and their homes, as if it's not crowded they are more than happy to tell you their proud stories. It really added to our experience and made us feel all the more welcome to be there. We even got to see a birthday cake come out for a family of about 8 while we dined. Grandma was celebrating with her family, which probably all were from New York, but you could tell she was happy to have them here in Rudar for some memories of back home.